In the 1970s I had the misfortune to be on a passenger jet that made an emergency landing. 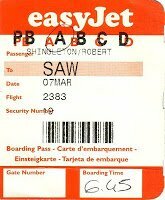 It was a British Airways flight from Berlin to Heathrow, and in those Cold War days international flights in and out of West Berlin had to make an intermediate stop at an airport in West Germany. My flight stopped at Bremen and shortly after taking off from there the BAC 1-11 jet suffered a major power failure that forced it to make an emergency landing. This incident happened in the days when aircraft seat spacing was considerably greater, when turnaround times were considerably longer, when passengers were not encouraged to cram as much carry-on baggage into the cabin as possible, and when cabin crew was a somewhat better paid profession. All the BA crew behaved in exemplary fashion and no one was physically hurt. But the experience was frightening, not only because of the very real danger but also because one of the passengers, quite understandably, had a panic attack during the emergency landing. Budget airlines dominate the market today and their profit margins depend on squeezing as many people and bags as possible into a very small space – the plane cabin – and squeezing as much activity as possible – loading, unloading and refuelling – into a very short time. I use budget airlines regularly and in general have found, contrary to received wisdom, they deliver exactly what they promise - no-frills low cost travel. But whenever I fasten my seatbelt in a crowded cabin with carry-on bags stuffed into every available space, I wonder what would happen in an emergency evacuation. Before I go any further and before the comments roll in, let me say I have every sympathy with professional musicians whose livelihood is threatened by restrictions on taking fragile and valuable instruments into plane cabins. It is a problem that must be solved, but the solution is not to plead that musicians are a special case and should be exempt from safety regulations. Seat belts are designed to restrain humans, not cellos. Which means in an emergency a cello becomes a projectile that at the best may block an emergency exit, and at the worst may kill someone. Based on what happened on that Berlin flight, I question whether a musician travelling with an irreplaceable instrument as oversize hand baggage would automatically abandon it in an emergency as required by safety procedures. There certainly would be a very strong temptation to try to escape from the cabin clutching the precious instrument and putting lives at risk as a result. And we just have to accept that storage is no longer available in plane cabins for oversized baggage - one airline even wants to remove toilets in an attempt to cram more people and bags into the cabin. Facebook petitions and stories demonising airlines will not solve the problem of transporting musical instruments. When it comes to protecting human life there are no exceptions – not even classical music. Musician’s livelihoods are under threat so it goes without saying that a solution must be found. But the search needs more light and less heat.